If you can, you can help! 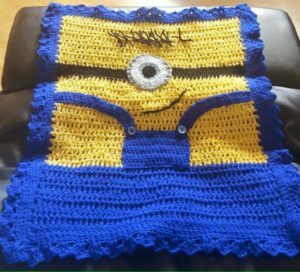 Bravery Blanky was set up by Susan Brown, a lady whose own son, Garda Ceejay McArdle, is fighting cancer. 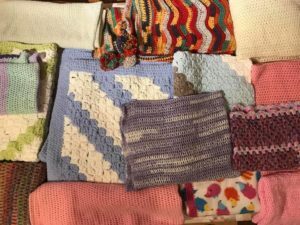 You can knit/crochet Bravery Blankies and have them given right to the (too) many children in Ireland who are fighting cancer. 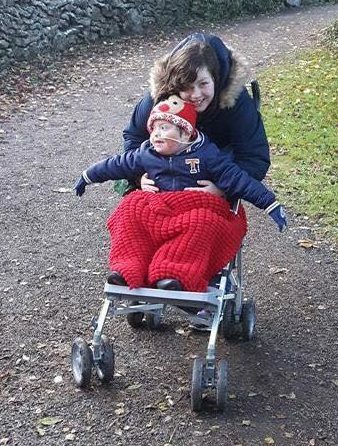 “During our regular hospital trips to the oncology ward, I started being really aware of the children lying in hospital beds for hours, receiving chemotherapy, fasting while waiting for theatre, and I couldn’t stop thinking about the comfort the ‘cozy’ had brought to Ceejay. We are so thrilled with Ben’s blanket. As kids on chemo feel the cold a lot more than the rest of us, this blanket has become Ben’s new comfort blanket. He loves the cosiness and warmth of it and loves playing with the little woollen baubles on it. It provides such comfort and security for him. 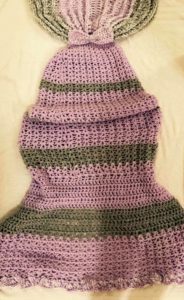 Below are the recommended sizes for a Bravery Blanky along with some of the drop off points. If you need further information, please visit the Bravery Blanky Facebook page (click here) and contact Susan. 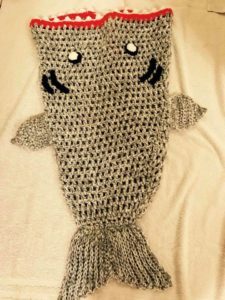 If you can’t knit or crochet, you can always recommend this page to your friends who can! You can also give a small donation to help cover the cost of delivering these Bravery Blanky parcels to the children! Of course, postage and couriers cost €, so if you’d like to make a small financial contribution (every cent counts! ), then you can do so on the Bravery Blanky Go Fund Me page right here: https://www.gofundme.com/bravery-blanky. 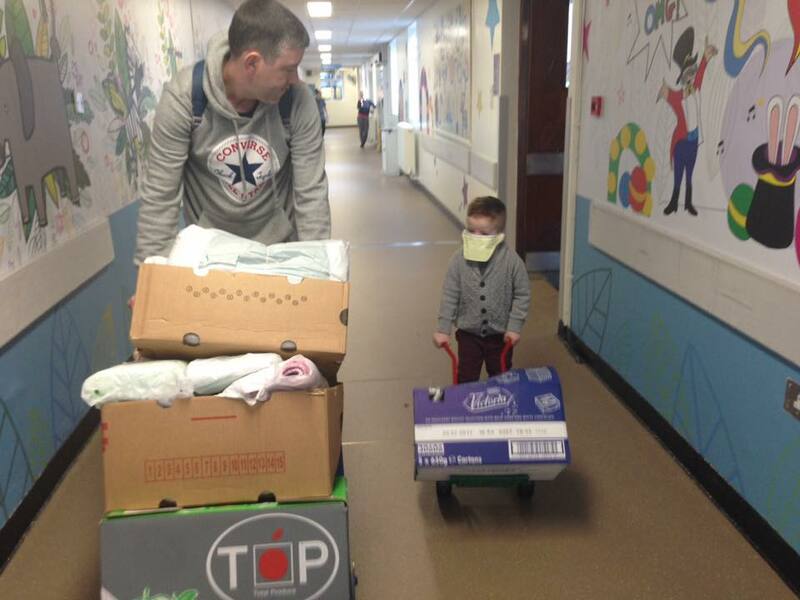 Special Delivery to St. John’s Ward from Garda Ceejay McArdle! 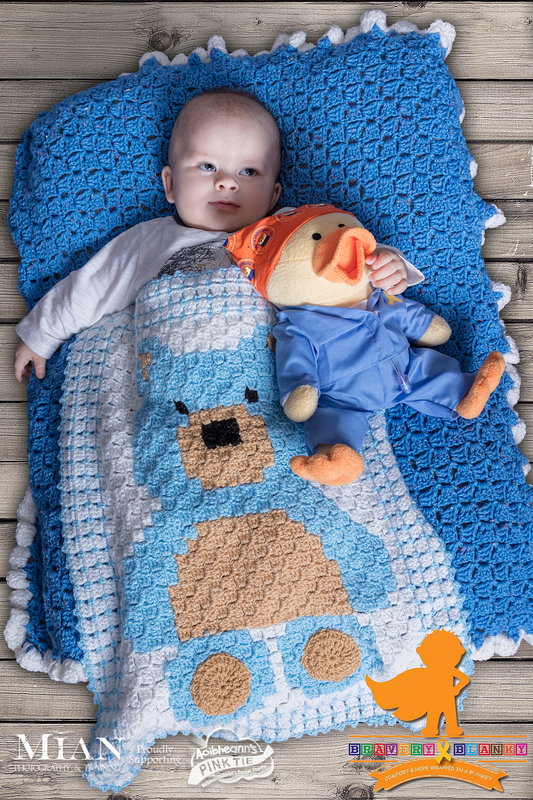 Note: Please note this is only a rough guide and there are no specific patterns or colours as Bravery Blanky likes for all of the blankets to be individual and special for each little hero. The only requirement is that the blankets are newly knitted or crocheted especially for Bravery Blanky and the material is machine washable as all blankets are washed in Fairy non bio and Dettol anti bacterial cleanser. This year, Bravery Blanky would love to provide blankets to the siblings of Angels from St. John’s ward. It is important that these families know how important they are and that they will always be a part of the St. John’s family. Derek Rochford – Cavan Garda Station. Annmarie Keane – Cheeverstown house, main reception, Templeogue, Dublin. Margaret Bannon – Cootehill Library, cootehill Co. Cavan. Tracy Ross – County Hall, St Alphonsus Road, Dundalk or Tracy Ross, Town Hall, Crowe street, Dundalk. Gina Leahy – Kilcormac Co. Offaly. Charles Byrne Music Shop, 21 – 22 lower Stephen St., Dublin 2, 01 4781773 or 0872458051, sales@charlesbyrne.com, Tues to Sat 10.30 am to 5.30 pm. Ethel Grant, Muff Donegal. Can arrange to meet for collection north of Ballybofey/Letterkenny. Contact page for phone number.